Monaco Baby! This is the race every driver wants to win at least once in their career, and it’s where many classic races have taken place. This is a street circuit, and it’s where track position, nerve, and consistency count for more than raw power in the car. 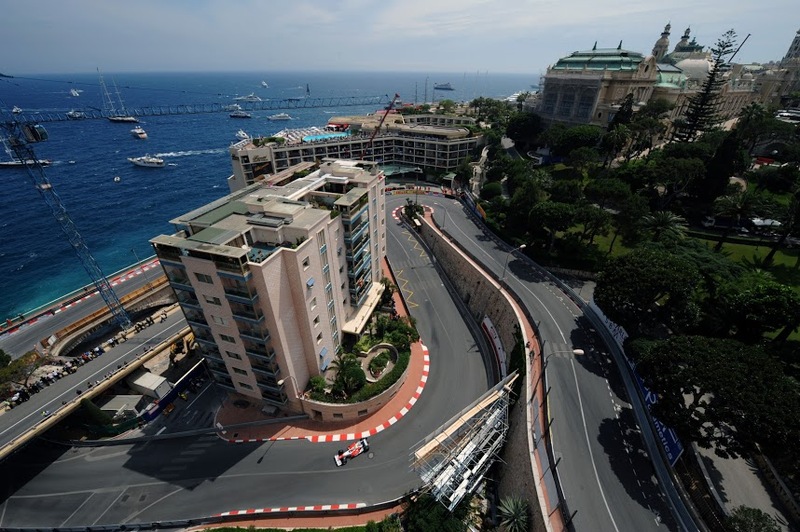 In first practice on Thursday, (Friday is reserved for serious paryting in Monaco) the 17-year-old Max Verstappen was the star, putting in the second-fastest time of the session behind Hamilton’s Mercedes. The young Dutchman is driving here for the first time, but is driving like a veteran – and the car underneath him looks more than capable of holding its own. The Williams cars seems to have problems on this circuit, and don’t seem to be able to generate enough downforce, so from practice sessions it was the Red Bulls challenging along with the Ferraris for second place behind the dominant Mercedes cars. Vettel was always looking strong, as was Kimi Raikkonen, but he made a mistake at St Devote in Practice 3 and slammed the rear left of the Ferrari into the barrier. Hamilton was not able to get a clean run in third practice to see what the supersoft Pirelli tyres, available for the first time this year, could really do, meaning Vettel topped the time charts – a slight psychological advantage for the German going into Qualifying. Not unexpected to lose the two Manor Marussia cars of course, preceded by one under-performing Williams car of Bottas, unable to get his tyres working, with the Saubers of Nasr and Ericcson just ahead. Ferrari and Mercedes both managed to get through Q1 without using their supersoft tyres, meaning they may both have an extra set of fresh tyres for the race tomorrow, and certainly have the benefit of the freshest rubber for Qualifying 2. The weather started to turn as Q2 started, with rain clouds sweeping in from Italy, and temperatures dropping to affect tyre performance. Alonso was an early casualty with what appeared to be an electrical failure, stopping on the circuit near to the pit exit with smouldering brakes. Grosjean, Button, Hulkenberg and Massa were eliminated, in respective running order. Rosberg edged out Hamilton, who was unlucky in traffic, to go fastest with an early lap 4 tenths of a second ahead, followed by Vettel and Raikkonen. However, Rosberg made an error at Saint Devote and went off into the escape road – but the main surprise was the performance of Pastor Maldonado in the Lotus to make it into the top 10, along with Sergio Perez in the Force India – both indications that it’s more the driver’s ability than the car’s excellence that really matters on this circuit. The Top 10 shoot-out started with skies glowering and darkening further, with a few spots of rain appearing over the circuit. Hamilton was out first to put in an early banker lap in case the rain became heavier to slow the track down and tyre temperature on a cooling track surface impaired performance to take his first ever pole in Monaco. Rosberg bailed out from his final flying lap as he could not make an impression on Hamilton’s time. Vettel made third, followed by Ricciardo and Kvyat in the Reb Bulls ahead of Raikkonen, with a spirited drive from Perez putting him in 7th ahead of Sainz, Maldonado, and a no doubt disappointed Verstappen. So it looks like it’s Hamilton’s race to lose – but will the performance of the Ferrari, generally kinder to its tyres, make a difference in the race? Very often, the winner is decided by the team that reacts best to unexpected events like a safety car appearance or the timing of when the front runners catch the backmarkers for the first time dictating the timing of the first pit stop. My prediction is for Hamilton to win, with Vettel and then Rosberg following. Enter your prediction in our FVL F1 Podium Winners Competition to win a £50 voucher.